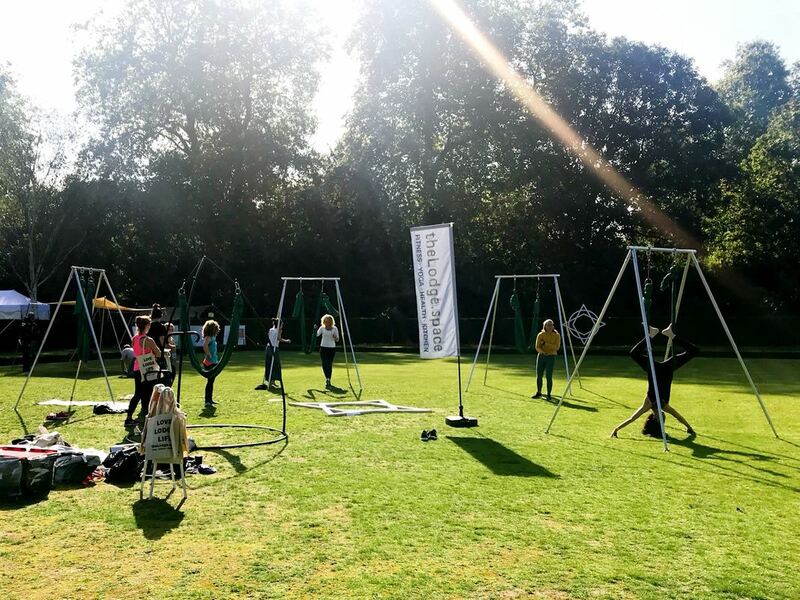 Featuring three mindful activities — running, yoga, and meditation — Wanderlust 108 brought some Saturday morning zen to Battersea Park for its second instalment in London. Ann McManus and Laura Jones were there. Embarking on such a positive journey, nurturing all our senses before midday on a Saturday, was a thoroughly energising experience. 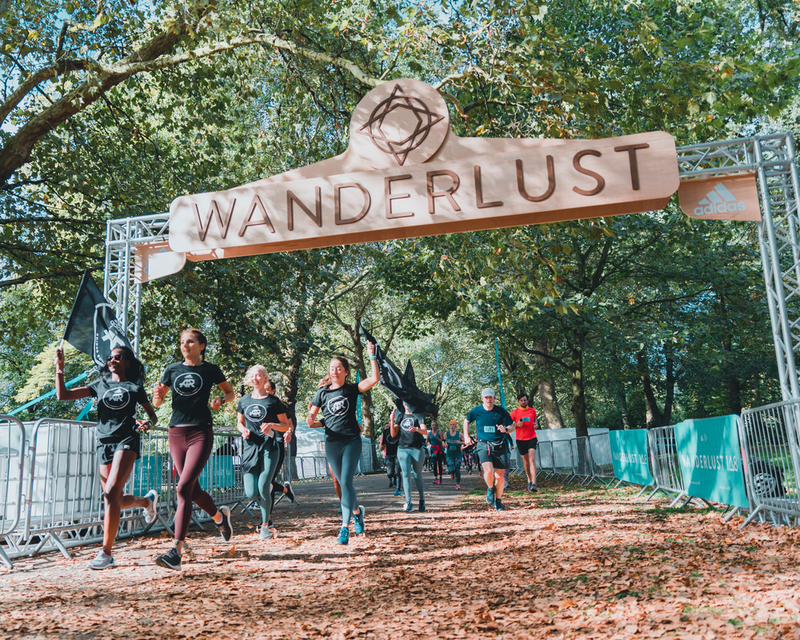 Ann said: “This year’s Wanderlust 108 took place in Battersea Park which was an improvement on last year in terms of venue as Battersea Park lent itself more to the sense of being in the middle of the wilderness, letting you fully tune out from the city-rush. 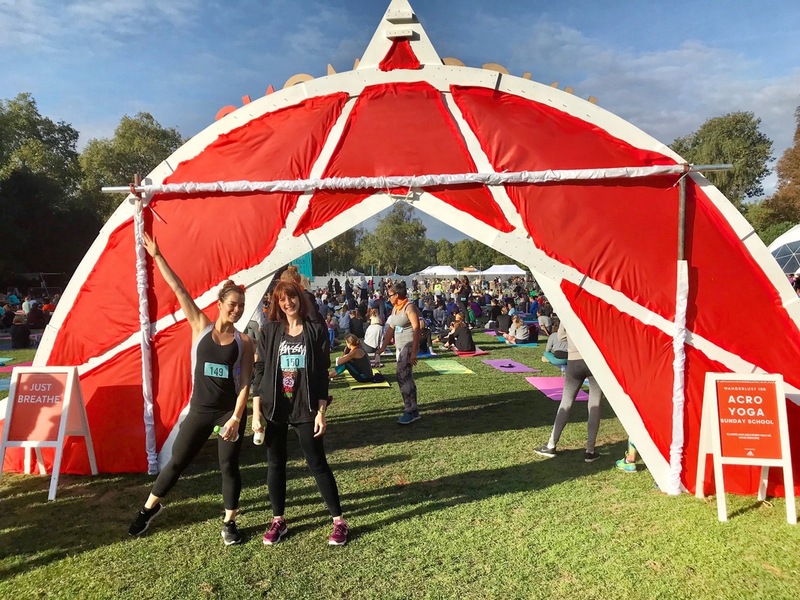 “Describing itself as a ‘mindful triathlon’ the event was due to begin with a 5k run, followed by 90 minutes of yoga and concluding with 20 minutes of guided meditation. Rosemary Water – served in a chic, white bottle, rosemary water is alleged to be memory enhancing. Sacred – organic, vegan, sugar-free, gluten-free cacao. The combination of cacao, cinnamon and chilli in the cup of Fire drinking cacoa with shot of espresso was a delicious ay to fuel. As someone who needs to work on getting more quality sleep, my big buy-in was spurred by the magnesium content (magnesium plays a role in supporting deep, restorative sleep by maintaining healthy levels of GABA, a neurotransmitter that promotes sleep). Not Corn – …it’s popped sorghum, an alternative grain to corn which uses 50% less water to harvest). Oprah Winfrey included it in on her list of favourite things. Unlike popcorn it does not get stuck in your teeth (please can cinemas start stocking up to avoid that awkward corn-stuck-in-teeth-moment on cinema dates?!) and coming in 3 flavours would be a great way to add texture to a salad or vanilla Alpro yoghurt. Artic Power Berries – trendily branded berry powders, made using berries that have “grown and matured under the midnight sun, absorbing the goodness from their unpolluted surroundings” in the Arctic Circle. Easy to add to a vegan yoghurt or protein shake for a vitamins, antioxidants, nutrients and fibre boost. “When it was time to hit the starting line for the 5k, many of the crowd had been glittered up as a nod to the festival spirit. Although the theme for the day was mindfulness, it was evident that many runners, myself included, would honour our competitive streak - after all, the invitation was to do the run “your way”. The conditions could not have been better, although I had not realised the route would be two laps of the same path and wondered to myself on the first lap how I’d so spectacularly aced 5k in 12 minutes… doh! 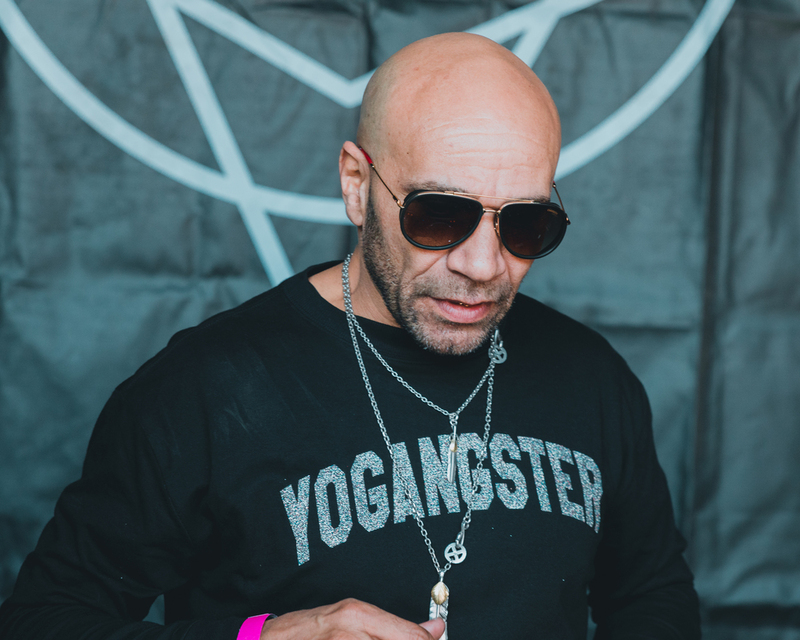 “To add a little edge to the event, the 90 minutes of yoga was accompanied by a set from legendary drum & bass DJ, Goldie. Personally, I avoid yoga classes as I so frequently find them quite boring and low energy (shout out to Broga as an exception). However, being out on the grass on a beautiful sunny morning with earthy drum & bass with the iconic Battersea Power Station peering over the field of yoga mats was something quite unique. 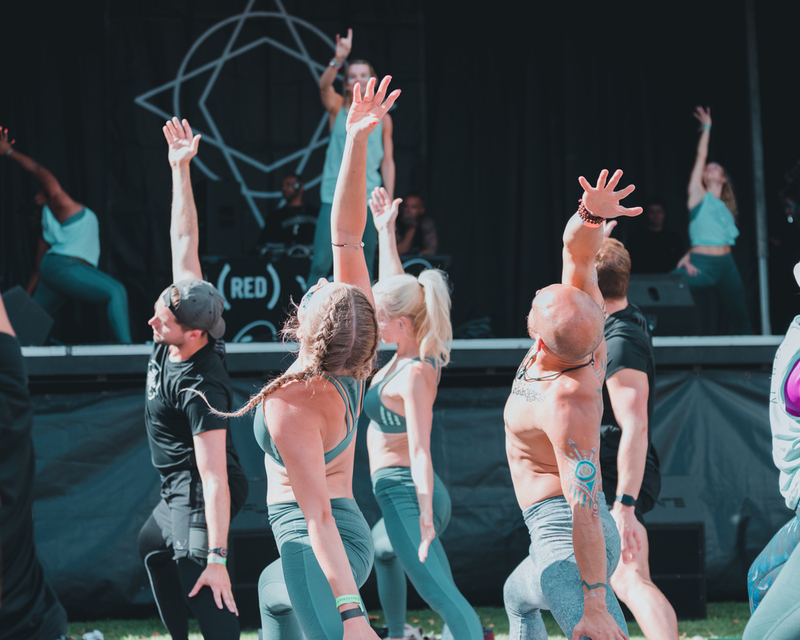 With the ever-enthusiastic encouragement of Adrien Mishler and Julie Montague, hundreds of lycra-clad ladies and a few gents stretched ourselves to a state of serene contentment. Variations in each movement allowed everyone to keep going regardless of ability. Rounding up with an applause and hugs as Goldie spun his and James Davidson’s Find Your Light-Beauty was a complete endorphin treat. “With our bodies feeling like temples, we moved to a mind cleansing meditation directed by the soothing voice of Michael James Wong, founder of Boys of Yoga. As we opened our eyes and drifted back to sync with the here and now, a blue butterfly fluttered through the air above the crowd and a very sweet cavapoo that had broken off its leash bumbled lovingly through the crowd to everyone’s amusement. 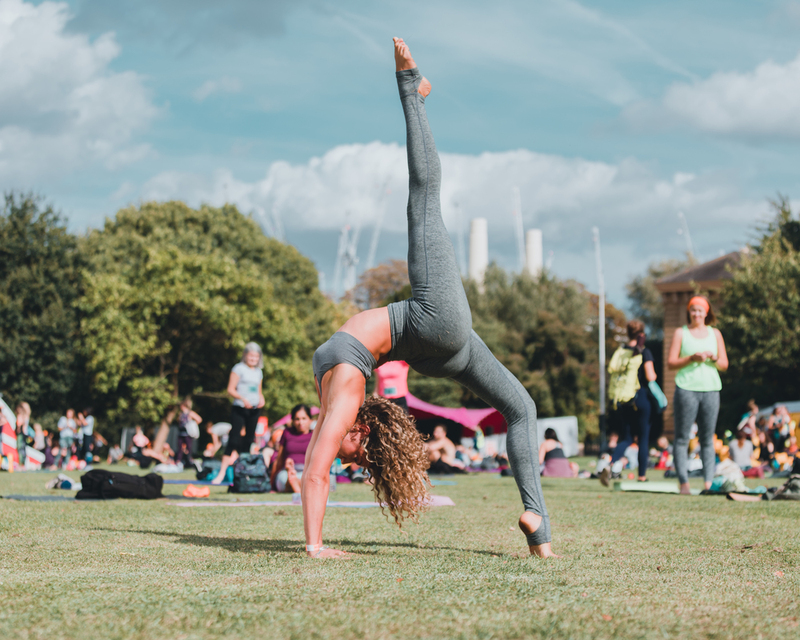 “If that wasn’t enough yoga, there were aerial yoga session on offer, hula hooping and all sorts of workshops promoting a nutritious diet and mental contentment. I most enjoyed electrical engineer turned monk Gaur Gopal Das who delivered the message that feeling successful was more important that being successful through a series of amusing anecdotes. The next European Wanderlust 108 events will take place in Lisbon and Rome on 30th September and tickets can be purchased here. Goldie is all 24 carat smiles as he pops out from behind the decks to give a friendly shoulder rub or words of encouragement to the yogis on stage. 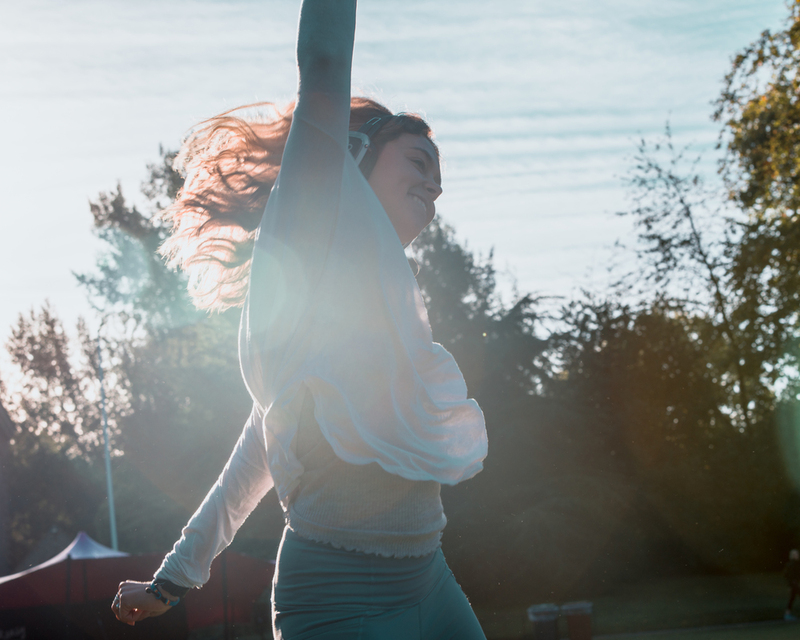 Laura said: “When your friend asks you to help review a festival on Saturday, you don’t expect to have to meet up at 8:30am in the morning - unless it’s an early start on the road to Glastonbury. But that’s exactly what we did last week for my first Wanderlust 108, from the global brand of wellness festivals that take place in over 60 cities in more than 17 countries on 5 continents, and came to our shores for the first time last year in the form of a mindful triathlon - a 5K run, followed by a 75 minute yoga class and then a 25 minute guided meditation. “Checked in, we had time to check out the order of the day. And what a day Wanderlust picked - shining sun, tiny puffs of white cloud in bright blue sky and grey herons chilling out on the boating lake. If one of the mantras was ‘positive vibes only’, the weather and setting made this incredibly easy. Making our way to the start line, refreshing coconut water sample in hand, we were encouraged to run, walk or dance the two laps. Whatever way you chose, it was not timed, and the yoga would not begin with a (hu)man left behind. 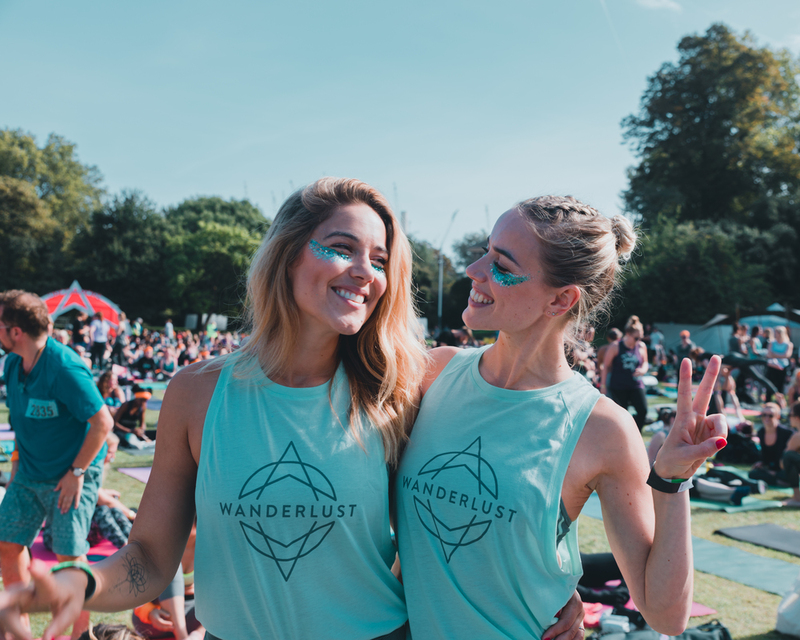 Making it non-competitive is important for Wanderlust to spread its message of togetherness. Which is why, having never done yoga before, I was not feeling nervous for what came next. 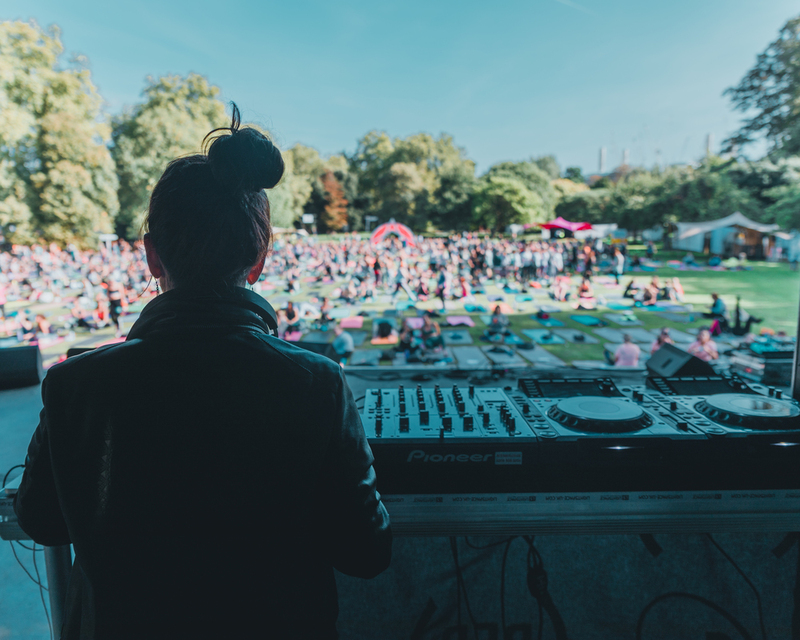 “Wanderlust say music is the heartbeat of its festival, and drafts in an eclectic mix of live DJs and bands to soundtrack the event. I might be a yoga newbie but one thing I do know is my drum & bass, and it was the man, the myth, the legend that is Goldie on stage for the next 75 minutes. Follow him on social media and you’ll know he lives by yoga since beginning his practice in 2010. So to beat the toll inner city life, inner city pressures can have on the body and mind, I make sure to follow every move of the class led by world-leading instructors Adriene Mishler and Julie Montague. But it’s too much to expect me to stay focussed and I let myself have a little shimmy When I should be concentrating on my downward dog! Goldie is all 24 carat smiles as he pops out from behind the decks to give a friendly shoulder rub or words of encouragement to the yogis on stage. “Still at the main stage, we were into the last part of the triathlon. More so than the two other activities, this was one I was glad I had practice in - sitting still for 25 minutes, led through the meditation by expert Michael James Wong, focussing on nothing but breathing is hard for a Londoner used to keeping up with the pace of the city! “Triathlon complete, it was time to refuel and reflect, with a little bit of retail therapy. 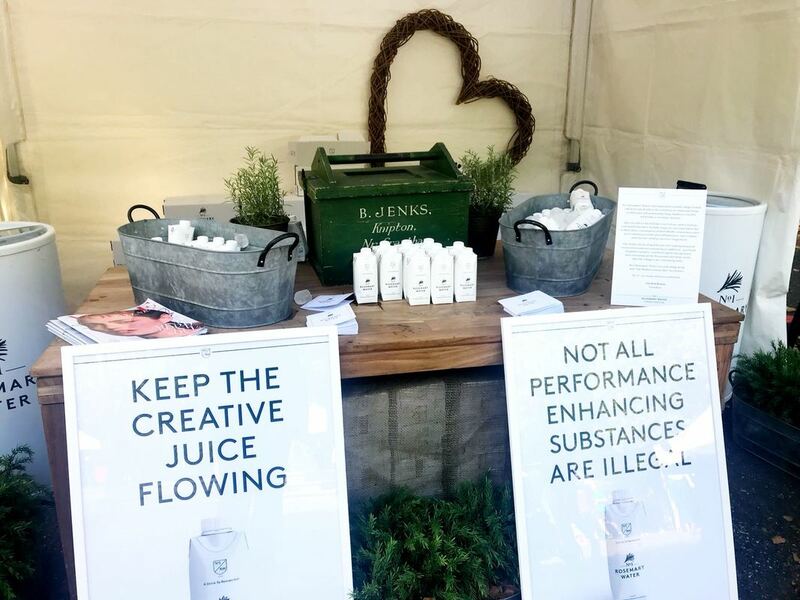 We were hydrated by way of Flow, an alkaline spring water that came in two yummy natural flavours - cucumber, and ginger and lemon. It was a palette cleanser for the various nutritious smoothies and nut bars we chowed down on next. A day doesn’t seem to go by without the next big superfood being discovered, and here we had a super grain, Sorghum, that can be popped like corn and flavoured, washed down with rosemary-infused water that promised brain boosting powers.